"P" CLIPS MILD STEEL VINYL COATED. Buy quality Auto and Marine Electric Parts and Accessories online, Sydney. CCM066mm Cable Clamp or "P" Clip Aluminium Chromate-Coated Mild Steel. Vinyl coated clamping area ..
CCM088mm Cable Clamp or "P" Clip Aluminium Chromate-Coated Mild Steel. Vinyl coated clamping area ..
CCM1010mm Cable Clamp or "P" Clip Aluminium Chromate-Coated Mild Steel. Vinyl coated clamping area..
CCM1111mm Cable Clamp or "P" Clip Aluminium Chromate-Coated Mild Steel. Vinyl coated clamping area..
CCM1313mm Cable Clamp or "P" Clip Aluminium Chromate-Coated Mild Steel. 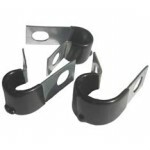 Vinyl coated clamping area..
CCM1414mm Cable Clamp or "P" Clip Aluminium Chromate-Coated Mild Steel. Vinyl coated clamping area..
CCM1616mm Cable Clamp or "P" Clip Aluminium Chromate-Coated Mild Steel. Vinyl coated clamping area..
CCM1818mm Cable Clamp or "P" Clip Aluminium Chromate-Coated Mild Steel. Vinyl coated clamping area..
CCM1919mm Cable Clamp or "P" Clip Aluminium Chromate-Coated Mild Steel. Vinyl coated clamping area..
CCM2121mm Cable Clamp or "P" Clip Aluminium Chromate-Coated Mild Steel. Vinyl coated clamping area..
CCM2424mm Cable Clamp or "P" Clip Aluminium Chromate-Coated Mild Steel. Vinyl coated clamping area..
CCM2525mm Cable Clamp or "P" Clip Aluminium Chromate-Coated Mild Steel. Vinyl coated clamping area..
CCM2727mm Cable Clamp or "P" Clip Aluminium Chromate-Coated Mild Steel. Vinyl coated clamping area..
CCM2929mm Cable Clamp or "P" Clip Aluminium Chromate-Coated Mild Steel. Vinyl coated clamping area..
CCM3030mm Cable Clamp or "P" Clip Aluminium Chromate-Coated Mild Steel. Vinyl coated clamping area..
CCM3232mm Cable Clamp or "P" Clip Aluminium Chromate-Coated Mild Steel. Vinyl coated clamping area..